Anybody run coax through the wall? I have the radio setup on the desk in the 3400 and have been pulling cable through the window. I'd rather not do that so have been thinking about going through the slide out wall with a female so-239 on both inside and out. Haven't really figured out a good way to do that to keep the connectors dry when not in use. I thought about the outside mounts like the Telephone/Coax boxes that are on the outside of my other rigs but don't think the so-239 will be long enough to both give the coax something to bite on and be short enough to still close the little cover. davidaf, could you install something like this http://www.amazon.com/Prime-Products...kup+for+rv%27s to the outside and this http://www.amazon.com/JR-Products-47...le+connections to the inside for your cable? Since I only had a single coax for the TV and park cable, I added a second external coax for satellite input. In my case I could remove a panel inside a cabinet under the TV and see the outside wall about a foot away.. Bought one of the external coax connectors with the plastic cover (just like in my convenience center), drilled a hole in the side wall, installed that coax connector, connected a short RG6 cable, installed a coax wall plate on the removable panel, and connected the other end of the coax to that. Worked out well. Can't remember off hand where I ordered the external connector from but can probably find it. TWeber and BB_Tx that's what I was thinking about but since this is for HAM radio the connectors are a bit different and RG6, tv coax is rated at 75 ohm so it's a bit of a miss match for 50 ohm ham radio cable. Below is a link for the connector i'd be using, it's wider and a bit longer than the RG6/F type TV connector. I thought about pulling out the connector in your link and opening the hole a bit but the SO connector is about twice as long so i don't think the little door will shut. 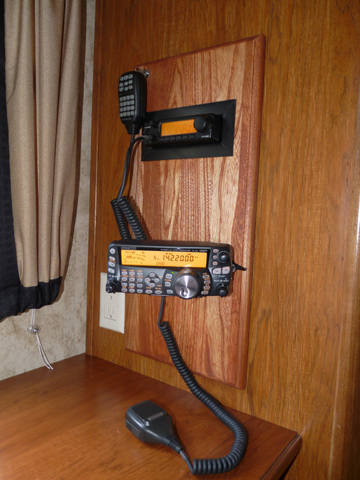 davidaf, I have a VHF and HF ham stick on a bracket on my ladder this is how I brought the coax into my 3402RL. The two 1/4" holes in the ladder mount allow you to put the coax into the rear cap, from the tail lights you can easily reach the coax and pull it over the the desk side. Under that slide the wiring goes up into the slide at the rear of the slide, this is where I brought the coax in and over to the CD storage that I have converted to hold my two radio's. Where is your antenna located and are you talking about one or more cables. Under the desk in my unit is a kind of kick plate that can be removed allowing access to the area behind the desk. davidaf would you be able to pull out the stock connector from the outside box in my previous link and install the one in the link below. Thanks TWeber, i have a few of those barrel connectors. Next time I'm at CW i'll pickup one of the boxes and see how much i can butcher it. I'm concerned the length of barrel required to connect the cable and get a good signal will be a bit to long but for a few bucks it's worth a try. I use single ham sticks, they mount into a mobile spring mount on a custom aluminum bracket mounted at the top of my ladder above the roof. I carry 10, 15, 20, 40 and 80 with me but do not use the radio a lot. 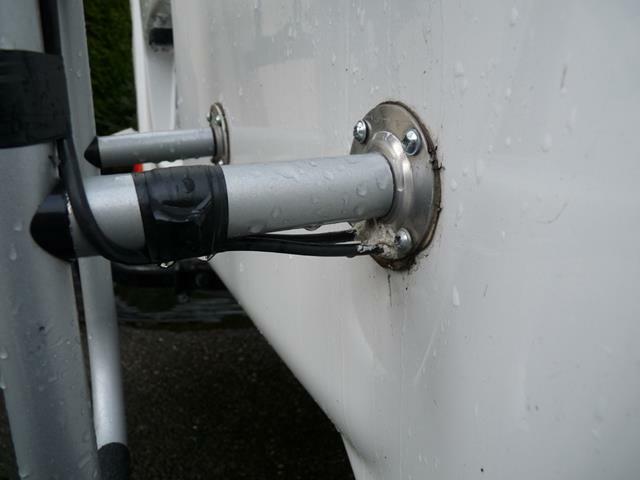 My VHF antenna also is mounted on this bracket. I have a large amount of noise on HF from the converter and have to actually shut it off when operating on weaker signals. I have seen the TransWorld antenna and it looks great. My setup at the desk in my 3402RL. So, I ran the cable right up through the existing hole in the slide through a couple small holes in the shelf below the desk where the radio has been since day one. Plus the antennas are temporary/portable so I didn't need to put much thought or effort into a permanant cable runs. Just needed them inside. Once I move tomorrow I'll pull the cable tester out and make sure the ends are good. Dave, i followed Ed's lead on coming in under the desk slide. Just pull the panel under the desk and you will be able to see where everything comes in. I ran 2 runs of rg58x that route that way and its great throwing up the hf vertical and the vhf/uhf x-50 without having to fish through the window. On the rear end i elected to run it along the top of the frame for the rear hitch instead of through the ladder mount. My 31ft s31v vertical sets on an 18" pipe that I had welded to one of those plug in hitchs. I wrap the extra coax on the ladder with a wire tie when going down the road. Google SO 239 bulkhead connector This would be the easiest way to get the coax through the wall, and if you drill close to the size needed and apply some sealant, it should be water tight. It might be good to put it inside one of those flip boxes as well on the outside. Previous posts are 4 years old.